Newgrass or New Grass music, also known as progressive bluegrass, a term attributed to New Grass Revival member Ebo Walker. Musicians and bands John Hartford, New Grass Revival, J.D. Crowe and the New South, The Dillards, Boone Creek, Country Gazette, and the Seldom Scene pioneered innovations in the genre. Some groups began using electric instruments and importing songs from other genres, particularly rock & roll. Newgrass or progressive bluegrass became popular in the late 1960s and 1970s, but it can be traced back to the banjo and contrabass duets that Earl Scruggs played even in the earliest days of the Foggy Mountain Boys. Many older newgrass musicians, along with music festivals such as NedFest, DelFest,Tall Pines Bluegrass and Telluride Bluegrass Festival, have been instrumental in cultivating the continued popularity of progressive bluegrass. NEWGRASS MUSIC, ALSO KNOWN AS JAMGRASS OR PROGRESSIVE BLUEGRASS IS BECOMING THE FASTEST GROWING MUSIC IN THE MUSIC FESTIVAL SCENE. NEWGRASS IS A WARM COMBINATION OF BLUEGRASS, FOLK AND ROCK MUSIC PLAYED IN A JAMBAND STYLE THAT APPEALS TO BOTH A YOUNGER CROWD AND THE TRADITIONAL BLUEGRASS CROWD. THIS STYLE HAS DEVELOPED FROM IMPROVISATIONS AND JAMS AND FROM OTHER STYLES OF MUSIC. SOME OF THE BANDS THAT HAVE MADE THIS POPULAR INCLUDES BANDS SUCH AS BELA FLECK, SAM BUSH, YONDER MOUNTAIN STRING BAND, FREE GRASS UNION, DONNA THE BUFFALO, PETER ROWAN, AND MANY MORE BANDS THAT ARE A BIG PART OF THE MUSIC FESTIVAL SCENE. NEWGRASS SOMETIMES USES INSTRUMENTS NOT TRADITIONALLY USED BY BLUEGRASS MUSICIANS. ELECTRIC GUITARS, ELECTRIC BANJO'S, SLIDE GUITARS, DRUMS(BOTH SETS AND HAND DRUMS), AND THE RECENT INTRODUCTION OF THE ELECTRIC FIDDLE. 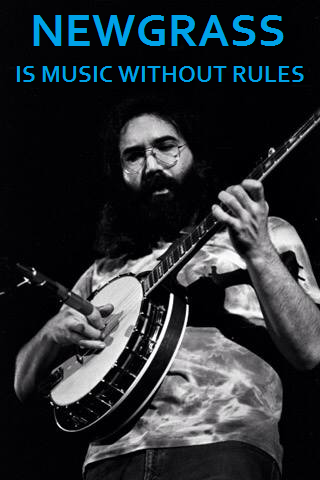 NEWGRASS CAN BE CONSIDERED BLUEGRASS WITHOUT RULES. NEWGRASS COMBINES FUN WITH THE QUALITY OF TRADITIONAL BLUEGRASS MUSICIANS TO CREATE A REALLY GOOD TIME. FOR ALL THESE REASONS AND MORE, NEWGRASS IS BECOMING THE FASTEST GROWING MUSICAL GENRE TODAY. LOOK FOR IT AT A FESTIVAL NEAR YOU. MOST FESTIVALS BOOK AT LEAST ONE BAND THAT CAN BE CONSIDERED NEWGRASS.